American Wholesale Property: Great flip opportunity in one of Houston's fastest appreciating neighborhoods! Great flip opportunity in one of Houston's fastest appreciating neighborhoods! Here is a great flip in the high demand energy corridor. This house is a lot bigger than all of our comps and I wouldn't be surprised if it sells for more than our estimated ARV. Based on price per sq ft this will be worth $233k. This house needs a little bit of everything for repairs but after $40k it will be the best looking house in the neighborhood. the best comp 2307 Briar Lee was hardly updated and sold for $80 sq ft in 8 days on the market. 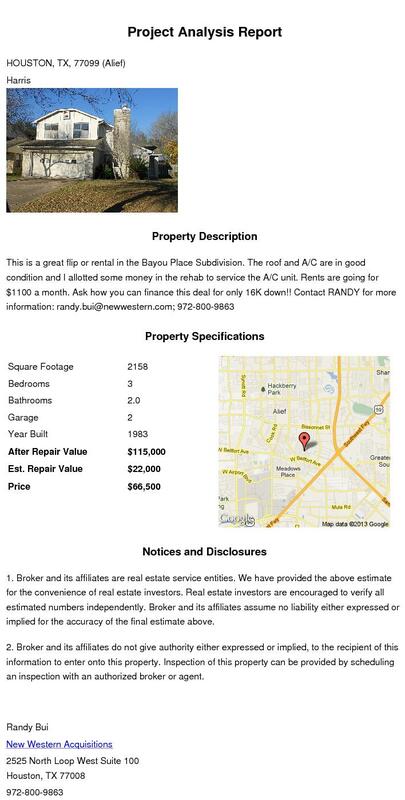 Lease comps are above $1,600 per month.Contact RANDY for more details; 972-800-9863; randy.bui@newwestern.com.